Front Hazcam image, showing the current workspace. This is a block of more coherent bedrock, surrounded by rubbly terrain, with lots of small rocks, pebbles and sand. Our weekend plan brought us to a block of coherent rock, a treat after spending many workspaces in more broken up and rubbly areas. The Geology (GEO) theme group uplinked lots of contact science here on Monday, so we are ready to leave and drive on to the next coherent block we have identified in the distance, a target known as "Midland Valley." Before leaving however, we planned contact science on "Ladder Hills," a beautiful example of laminated bedrock. APXS will be used to determine the chemistry, to compare it to our other targets in this workspace "Gannet" and "Curlew." MAHLI will take images of the laminations within Ladder Hills from two different angles - straight downwards onto the rock surface (the spot where APXS will also analyze), and from an oblique angle. ChemCam will acquire active LIBS (laser) analysis of Ladder Hills, in addition to analysis of "Fyvie," a large pebble for comparison with bedrock targets. The plan features lots of Mastcam imagery. Both Fyvie and the post-drive AEGIS target will be imaged, in support of ChemCam science activities. Two mosaics will focus on the laminations in the workspace, in the targets Ladder Hills, "Ladyburn" and "Loch Gelly." Multispectral documentation will be taken of the Curlew target, which was brushed in Monday's plan. There is a mosaic of two linear ridges in the distance ("Gilles Hill"). Mid-way to our next stop at Midland Valley, we will stop at a small ripple field. Using Mastcam, we will image the undisturbed sand, before scuffing using the right wheel, back away a little, and then take another Mastcam image of the disturbed sand. These images will be used to further characterize the physical properties of the sand in this area. Then our drive resumes, hopefully ending on bedrock for our upcoming weekend plan. Following the drive, APXS will do overnight measurements of argon in the atmosphere, as part of a long range experiment looking at changes in argon abundances and seasonal variations. In parallel to the very full GEO plan, the Environmental (ENV) theme group also has a very full plan. The main ENV activity is a ChemCam Passive Sky observation, which lets us measure the column abundance of water vapor, oxygen, water ice and dust in the atmosphere, and also gives us some idea of dust and water ice particle sizes. This is particularly interesting as we just had some regional dust storm activity on Mars, so there's still quite a lot of dust in the atmosphere above the rover. For this reason, we're also very interested in the two Mastcam atmospheric opacity measurements in this plan, which will tell us how much dust is still up there; recently, opacities have been trending down. 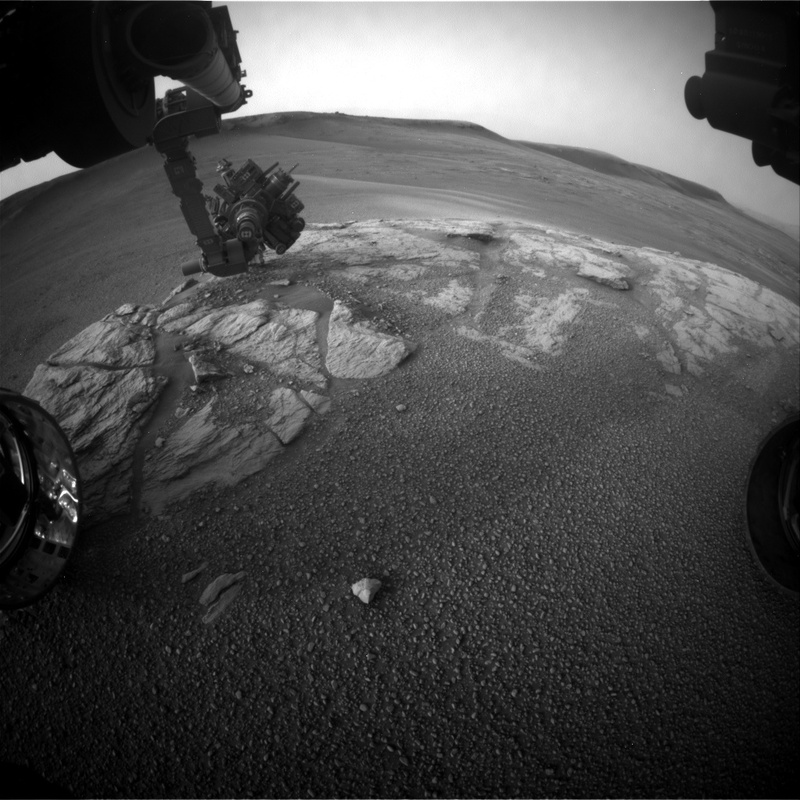 ENV planned some Navcam movies, as part of an ongoing campaign to examine martian clouds, their properties and abundances. The "zenith" movie looks directly upwards to look at clouds and their direction, whilst the "suprahorizon" movie is targeted in a more horizontal direction, looking at clouds and variations in optical depth in the atmosphere above the north rim of the crater. ENV also planned Navcam and Mastcam "dust devil" movies and surveys, which measure the number, location, and characteristics of dust-filled convective vortices, which in turn tells us about surface heating, convection, and winds near the surface. These observations are targeted lower than the suprahorizon movies, to search for dust devils across the crater floor on the slopes of Mount Sharp. Excitingly, this plan sees the very first use of Mastcam to take a dust devil movie, which will give colour images and better resolution (although over a smaller region) than Navcam. Finally, there were also standard RAD, REMS and DAN activities.